Yes, your developers are passionate about cutting edge innovations and want to exceed expectations in all aspects of design. But that does not guarantee customer buy-in. Many software and internet companies with great product ideas and rocket high initial growth rates have failed to achieve product/market fit. The key reason behind lies not in quality management or financing, but in the incompetence to understand and meet the wants and needs of the market. You might have the best expertise in the industry where your company operates, but that professional knowledge will never be more valuable to the business than customer insights. Hotjar, gave credits of their fast growth to the “staying close to our customers” mantra – in just 5 years they’ve gone from €0 to €17 million in Annual Recurring Revenue and their product has been installed on over 670,000 sites. The best way to ensure your new developments will gain the likes of the market is to listen to the voice of your customers. Let your customers make product development decisions for you! Use customer suggestions and opinions as a decision-making guideline. Adjust your products and services to perfectly fit customer needs. In this era where new technology pops up every day, you are required to constantly make changes to your products. Change means opportunity, but no doubt it also means competition. In this game of change there will be losers, if one complicates the product or is unable to stay relevant. And there will be glorious winners, gaining maximized customer retention and triumphing the market share. How you strategize your move when faced with change is critical. By adopting a customer-centric strategy, putting your customers first and involving them to shape the future of your product developments, it not only aligns their demand with your supply, but they will also feel valued. When customers feel that they have been involved in the product development and will inevitably become loyal customers. 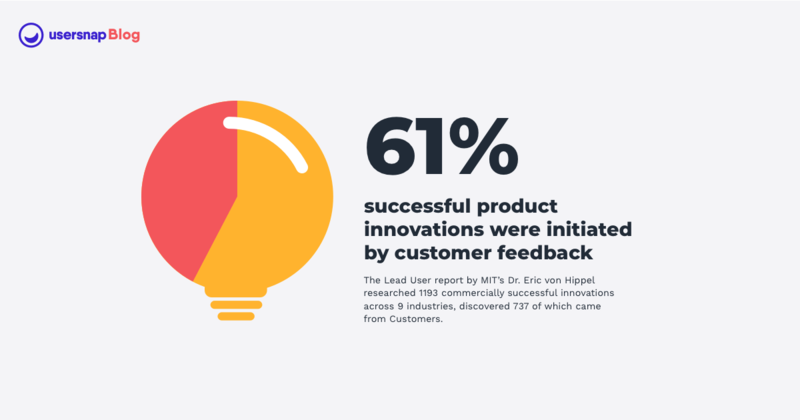 A substantial study on 1193 commercially successful innovations across 9 industries, directed by MIT’s Dr. Eric von Hippel, discovered that 61.8% of those product developments were generated from the customers. He then came up with the famous term Lead User Innovation Method, in which the sophisticated users are the pioneers to identify a new need in the market and make a breakthrough innovation. This is strong evidence that customer feedback can direct your product managers and developers to extraordinary achievements. Today’s technology and product designs are heavily based on the experience. It is through the seamless customer experience that Apple products managed to stand out from the rest of the competition. You need to focus on creating a complete customer experience when developing products. At every touchpoint of the customer journey, each experience should be adding value for the product and brand. And naturally, the most effective way to give customers amazing experiences is to ask them what they like about your service and what should be improved. The popular saying “Customers are Always Right” stands not only for customer service but should also be incorporated to your actual product and service model. There is no school to teach you the best way to build your website interface, as designs and user habits come in and out of fashion, but the rule to follow customer feedback is something you should always hold on to. Now that we’ve covered the benefits of listening to your customers, you will want to start thinking about how to implement this strategy into your product development routine. In different stages of the product development process, the approach you should be taking to obtain feedback differs. It is crucial to keep in mind that the feedback must be actionable, so it is necessary to plan in advance how to effectively gain customer insights and where to apply the findings. Below is a breakdown of the product development process, and why Voice of Customer is essential to each step and how you can apply the most suitable feedback tactics. To develop a new product the team has to generate a bunch of new ideas, this brainstorming process can be both stressful and extremely inefficient. Even when a set of ideas are agreed on, you are still taking on a high risk of failure in the market. To prevent such a “gut” based method, you should turn to your existing customers. Review what your customers have been saying, run a poll with your customers or request directly for suggestions. From concept to reality, you will be faced once again with many uncertainties in details and designs. You will find it close to impossible to proceed without any feedback. Most companies turn to leaders or internal feedback networks in making development decisions. However, taking into consideration what we mentioned above, the customers know what they need best. So you should really be seeking for their opinions. On every step of the way, ask for validation and confirmation of functionality from customers. Don’t wait until your budget is exhausted. This is the typical stage of product development where usability testing begins. Often this is also the first time that the product is presented to the customers and feedback is received. Using the “80% of New Products Fail” myth as reference, you can easily imagine how much greater the percentage of prototype failure must be. To prevent going back to the drawing board at this stage and wasting all that time and money, you should start asking questions to your customers before prototyping. This is not to say prototyping and product validation is unnecessary. But the depth of the testing and observation can be even more valuable and accurate if the voice of customer was involved throughout product research and development. You should have several alternative product prototypes for the users and customers to compare. When customers tell you about their experiences and feelings, you can use the “I Like, I Wish, What If…” method to solicit critical feedback in a positive manner. 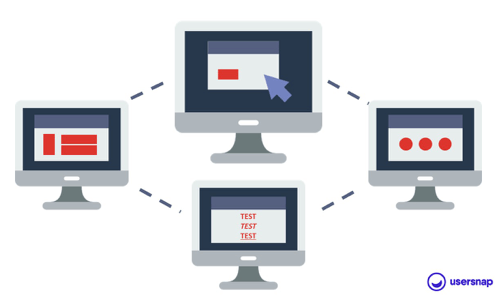 Make sure you are testing the prototypes across different levels and segments of customers, as different customer groups can help to uncover unique problems. Once you are happy to roll out the product, your main effort would shift to marketing and sales. You should also keep an eye on the Customer Service team, or the Customer Success team, as they will be receiving first-hand customer feedback. Make sure your customer service channel allows clear communicate. Sometimes it might seem that customers don’t want to tell you about their problems. That’s false! Inefficient feedback systems are what puts them off! Is your feedback widget easy to find? Does the widget design match your branding? How long does it take for customers to submit a feedback? Do you support visual feedback and screenshots? How does your support team manage the tickets? How many times of back and forth does it take to resolve the issue? With the information collected from the customers, you can identify overlooked bugs and many interesting insights. Use customer feedback to pick up potential new product ideas. By labeling the feedback tickets and categorizing them, you can easily utilize voice of customer for development process. Smart companies are diligent in performance analysis and collecting customer feedback. The behavior of customers will evolve with time, and what used to work may become insufficient. No matter where you are at in your product development, you always need to pay attention to the voice of customers to stay relevant. In recent years, more and more product feedback tools for digital products have popped up on the market. You can find many online tools easy to implement and versatile. They can help you to collect feedback, test ideas and send surveys in the process of your product development. The prices of these tools usually depend of the number of users. Generally, for a medium-sized company the monthly fee being around $150. Hotjar A tool designed for understanding customer behavior in digital products. Track what users are doing and ask for feedback on their experiences. Usersnap Collect website and CX feedback on-site or in-app with an easy to integrate widget. Manage the feedback in the dashboard or send it to Jira for product development purposes. Canny A product feedback tool that enables users to create boards where visitors can post as well. Additionally, there are voting options, user reports, tagging options and more. SurveyMonkey Create surveys to conduct market research or to obtain customer feedback. Surveys can be sent out via email, mobile, chat software, websites, social media and more. Qualtrics Get insights on customer satisfaction and hear from what matters to them. Use the data to improve customer retention and loyalty. When selecting the right tool for your company, you should firstly focus on functions that help you gather the necessary feedback from customers. But just as importantly, the tools need the capability to generate actionable data. What happens when you don’t have a customer feedback system? In Zendesk’s review of customer service within social media, 62% reported having used social media for issues and feedback. Customers love being heard. They are more than willing to share their opinions – good or bad ones – with you more than you may have imagined. How to provide a healthy and efficient platform for customer feedback needs to be your priority if you don’t want to miss out on their valuable insights. Leading companies are actively listening to the voice of customers and effectively using these insights. 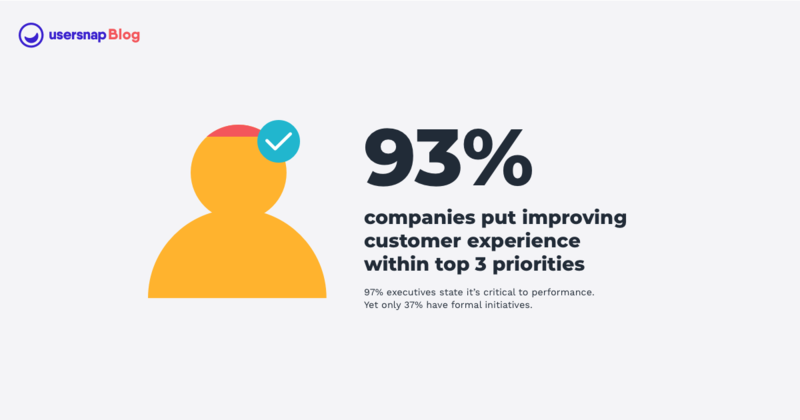 In a study conducted by Oracle, a whopping 93% of executives said that improving the customer experience and listening to the voice of customers are within their top three priorities to be addressed in the next 2 years. However, only 37% have actually made implementation, the other 56% have fallen short of their words. No matter the size of your business, evolution is inevitable and you have to adapt to survive. If you don’t listen and improve your product based on customer feedback, you’ll quickly lose those customers to competitors who will. To stay ahead of the competition you should have a clear plan in gathering feedback and how to combine them with business strategy. Acting on the voice of customer in a timely manner is one of the most powerful change you can make in the product development cycle. You will see remarkable growth in product success and customer loyalty. To learn more about Usersnap and feedback solutions, used by Microsoft, Facebook and many more amazing brands. Visit our visual feedback tool page or customer experience feedback tool page. Free 15 days trial – no credit card needed.